Brand is a one of the most valuable asset of any business. 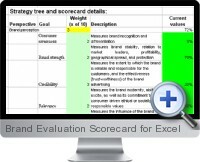 Brand Evaluation Scorecard for Excel measures how is a brand is performing. Brand Evaluation Scorecard for Excel enables to answer questions to make the process of branding more measurable and controllable. Brand Balanced Scorecard will give an overview over such branding metrics as brand strength, relevance, credibility, customer preference, lifetime value, revenue generation capabilities, brand added value.